tl;dr: success is an iceberg and what’s below water can be violent, sometimes. Many people tell me often how lucky I am that I’m getting free stuff from Rainbow Six or getting retweeted by Bungie or just because I have a little corner of fame on the internet. But let me tell you how it really is for me. I’d rather call it work rather than luck. Even if luck is a factor ! But not the only one. First of all: the work. My comics take basically all of my time. I don’t have a steady job yet. I don’t go out much, I’m quite a lonely person and sometimes I refuse to get out and see my friends or family to work on my comics. I see my friends once or twice a month. Whenever I’m told that I’m “lucky”, it leaves a bitter taste in my mouth and here’s why: I just think of those past years where I’ve been severely depressed, and my comics have been my link to society. Didn’t go out at all. Wanted to kill myself (for real, depression kicked really hard). Dramatic lack of self esteem. Folks around me calling me lazy and dragging me down. But people laughed at my funny comics. So I stayed there. And I worked on getting out of depression with the help of doctors, psychologists and others. Still working on it. My comics, as silly as they may seem, take time and effort and I’ve been working on them really hard for the last two years. Working. Without doing anything else, beside trying to heal, alone in my room. No real psychological support from people around me. Not a real job, they say, I’m the black sheep of the family, trashtalked. Your support has been amazing through this journey! So yeah, whenever I’m shared with official pages, it feels really good, like the final reward! I guess some people envy it, this little minute of notoriety I get after years of building my corner in communities. But do they see what’s behind ? I’ve learnt everything on my own, drawing, softwares, with sometimes the tips of others artists (bless them all, they know who they are <3). I built my pages on my own, worked on my brand on my own, and now it works: I have people following me. Big gaming company being friendly with me (ILY Ubi, no game company is as rewarding as Ubisoft, honestly, feels good to be one of your players). It’s every fanartist’s dream ! But it doesn’t come on its own. Also I submitted my work to the right people ! 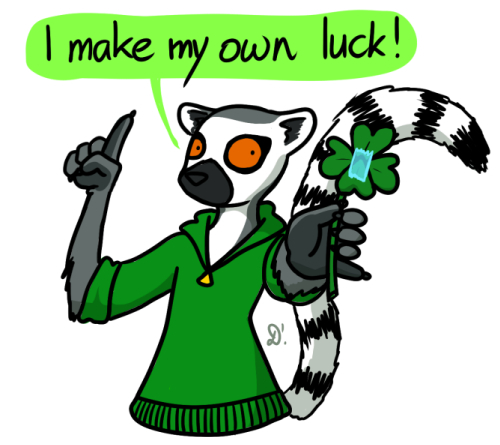 That’s what I mean by “make my own luck”. Even if you’re talented (I don’t consider I am), people won’t knock at your door if they don’t know you exist. So communicate, hashtag, submit to the right person without spamming them, all it takes is a share by the good person, but YOU must target them or get their attention with hashtags ! I’m not getting any money from it. I don’t have a partnership with Ubisoft or Bungie. 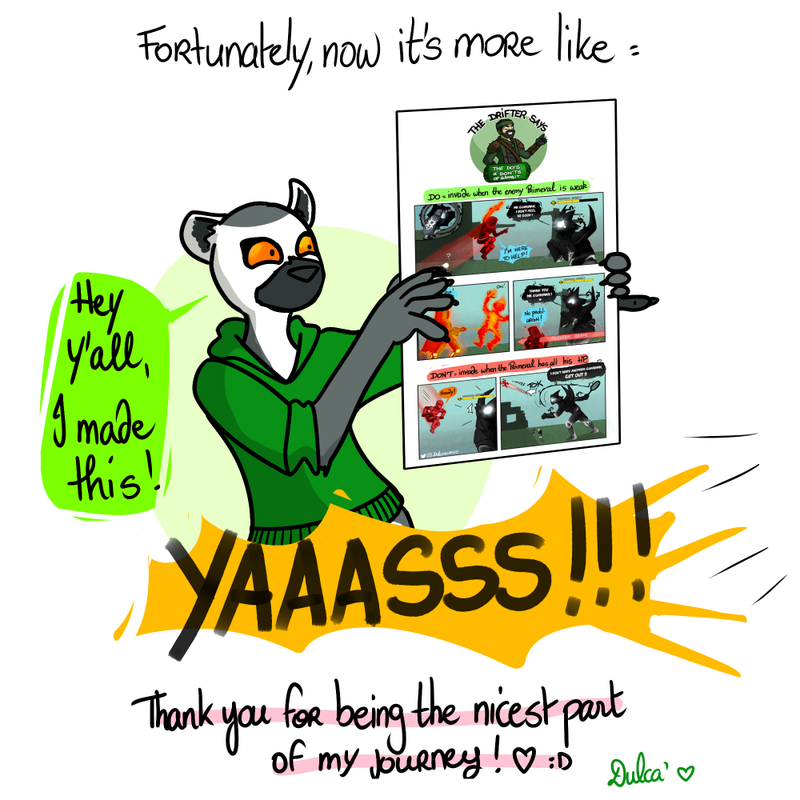 When I post a comics and it’s successful, all I get is a feeling of work well done because people laughed, and it’s AMAZING and makes me think it’s all worth it (believe me, I know what it’s like to have a ray of sunshine in a dark day) but I still struggle for basic needs. Still, knowing that I can make people smile is priceless. Interacting with the community, answering comments, questions, DMs, remaining positive no matter what also takes a great deal of time and energy, it’s a 24/7 activity. I’m my own community manager and I learn as I grow. I try posting at the right time, with the good hashtags, submitting my work to the good places even if it implies some unpleasant dramas. 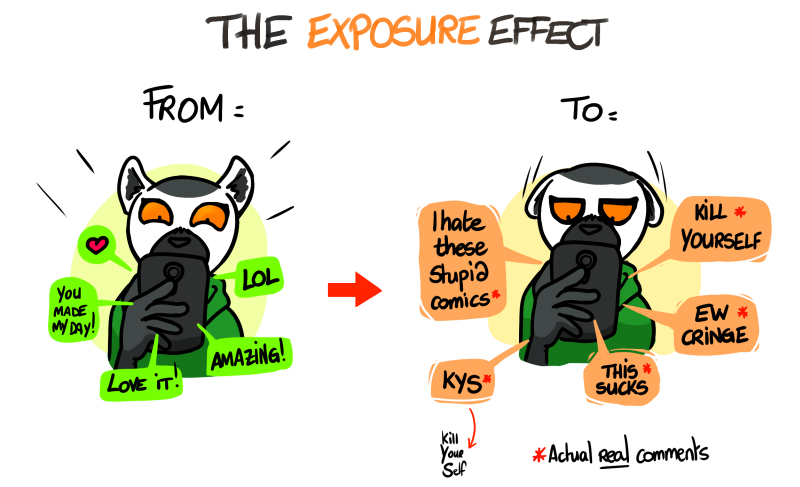 I learnt it the hard way: with exposure come the haters, always ready to spit on you, on your style, on your sense of humor or even your physical appearance. Sometimes they raid your pages and comment with nasty things over and over again until you block them. The kinds of comments you get as your audience grows. Not only assholes ! But they happen and sometimes they’re really violent. The slightest mistake you make in a comics is pointed out and harshly judged, they want to expose you to be noticed. There are also the jealous ones, even amongst friends, who want all that you’ve got but without doing anything. But I’ve learnt how to avoid focusing on the bad guys, the most unpleasant minority can be the loudest, but the love is real, and much more important ! But of course there’s a bright side. The recognition from the mother ship (Ubi, Bungie), the love ! The community I gathered around my silly comics is amazing. Lots of new friends, lots of people who remember my comics and see the whole universe I build around them, the running gags, the stupid catchphrases… They follow me on every stupid decision I take for the characters and laugh with me even at my terrible attempts to be funny. Fortunately my followers are so much nicer than those assholes ! !